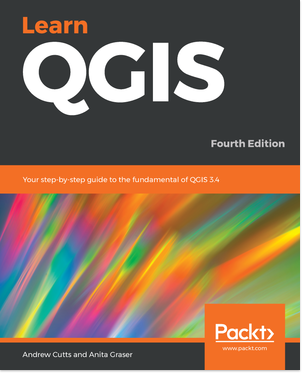 This summer (2018) I was asked to update the book ‘Learn QGIS for 3.4’. I feel honoured to have updated Anita’s original book, now in its fourth edition. Many thanks to her for the opportunity and for kindly reviewing and offering constructive criticism. I’ve always been keen to expand my toolbox. One of the great things about GIS is that there are so many ways to achieve an answer and many tools with which to do it. When I first started using QGIS (or Quantum GIS as it was called), I saw it as another tool in my toolbox. At the time I was using a couple of proprietary software’s as my main toolset. If what I was doing didn’t work, I’d turn to something else. Over time that something else increasingly became QGIS. I wasn’t an early adopter of QGIS. I think I first became aware of it circa 2010 and it wasn’t until I attended FOSS4G in Nottingham in 2013 that it really started to stand out as a tool I should be using more frequently – about the same time I started looking at PostGIS. Since that point it has become the most important GIS software I use today. At the time of writing, QGIS is now at version 3.4. It will become the long term release (stable / recommended version) early in 2019. QGIS 3 has been ‘out’ for almost a year. While I was updating the book I was amazed at the sheer number of improvements/additions/changes that have been made in the move from v2 to v3. Huge credit to the development community – thank you all. There are just so many things, it is impossible to do justice to it. Have a look at the visual changelogs for more details. It is definitely worth following @northroadgeo on Twitter and their 24 days for QGIS 3.0, which I think may well be updated this December for QGIS 3.4. In season 3 episode 3 of the #scenefromabove podcast we talked a little on this topic. The trend seems only, to me at least, to be towards increased adoption of open source technology. Can you imagine it becoming less open? What is often forgotten, or certainly not talked about enough, is the impact of open source software, and in particular open source GIS software. From how I see it, by far the most commonly used is QGIS. The amazing success of the open data policy of USGS/NASA and the Copernicus programme is in part due to the ability to consume this downloaded data in QGIS. The Semi Automatic Plugin which I wrote about here does an amazing job at using this data. When I see new companies showcasing their amazing Earth Observation applications, screen shots of QGIS are often seen. In larger companies more non specialists are downloading and installing QGIS – to view data initially – but the sky is the limit. If people with non GIS specific backgrounds are using software like QGIS then that can only be a good thing. Obviously I’d love it if you bought a copy and wrote an amazing review, or shared this post within your network. However, I am happy if you just download QGIS and give it a go – I am sure you will be amazed at what you can achieve. I think it has the potential to become not only one of the tools in your toolbox but perhaps the fundamental one. This entry was tagged book, QGIS3. Bookmark the permalink.